Some of you may have guessed that we recently went away on holiday. Whilst we are away, of course we like to relax and I usually don’t think too much about Red Ted Art. 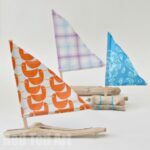 But in our family it is inevitable that we DO DO just a little crafting on the go. 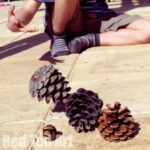 Last year we did get crafty too and made some pinecone people, boats, mini books, paper planes and monsters. 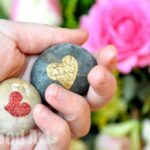 All easy “on the go” kind of crafts. This year we also got creative….. 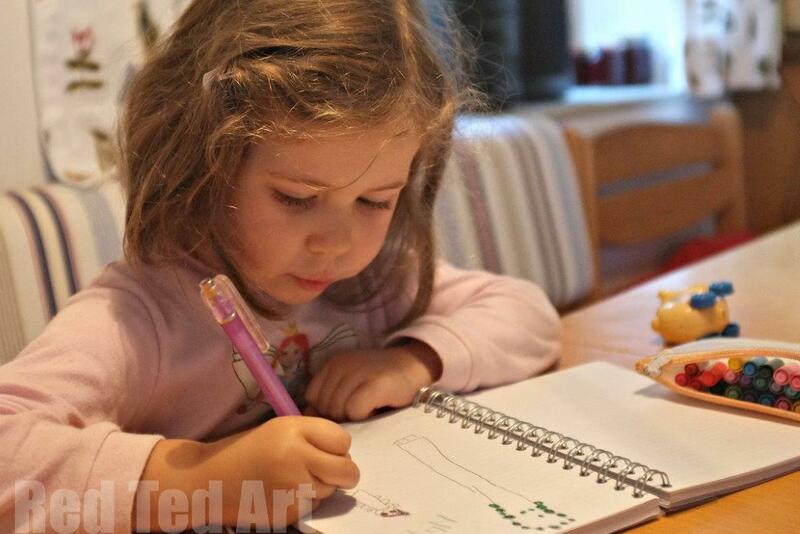 The first thing we always have on holidays, are pens and notebooks. 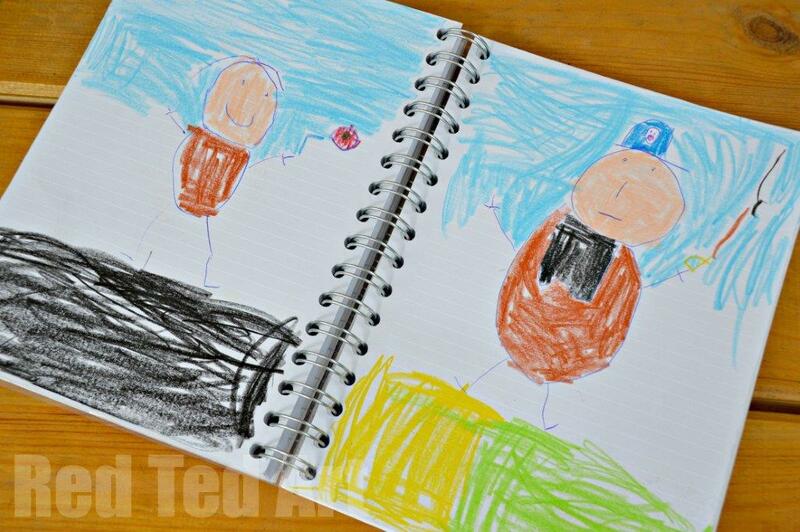 I take them everywhere we go, as the kids can get scribbling and in Red Ted’s case writing a little too. We actually used his note book as a Photo Journal – each day he took a photo on my smart phone and wrote one sentence in his book. When we got home, I printed out his photos and stuck them in. 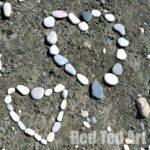 It was a great way for me to encourage him to practice writing, as well as get him interested in writing and continue practicing. 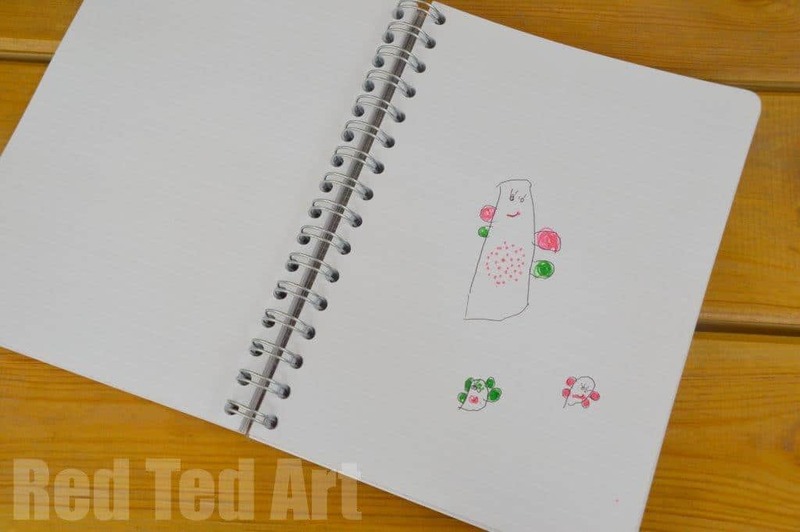 The notebook was also used for LOTS of drawing by children. Great for moments at the airport or quiet (?) moments in the morning! The rest of our “crafts” were very spontaneous. Red Ted found a rock that had split in two. And he decided that they were “dinosaur fossils”. 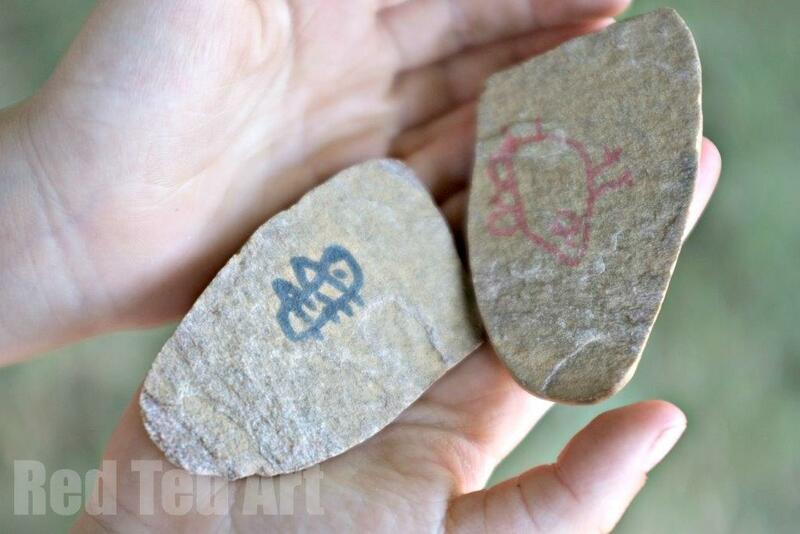 The fossils of course needed some “imprints”, so Red Ted drew his own dinosaurs on them. I thought it was a totally adorable idea. Next up, after prepping our lemon marmalade and leaving it covered in foil overnight. I didn’t want to waste the large sheets of foil we had used, so made some crude aluminium foil people for the kids. One, quite by accident, turned into a superhero. The kids christened them, Luke, Dark Vader and Prince Leia…. can you guess what they are into? 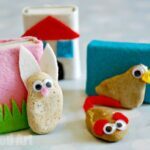 Finally, and probably our most “proper” craft and something that we come back to time and time again – spontaneous, nature based FAIRY HOUSES! This is the third fairy house we have made in the last year or two. 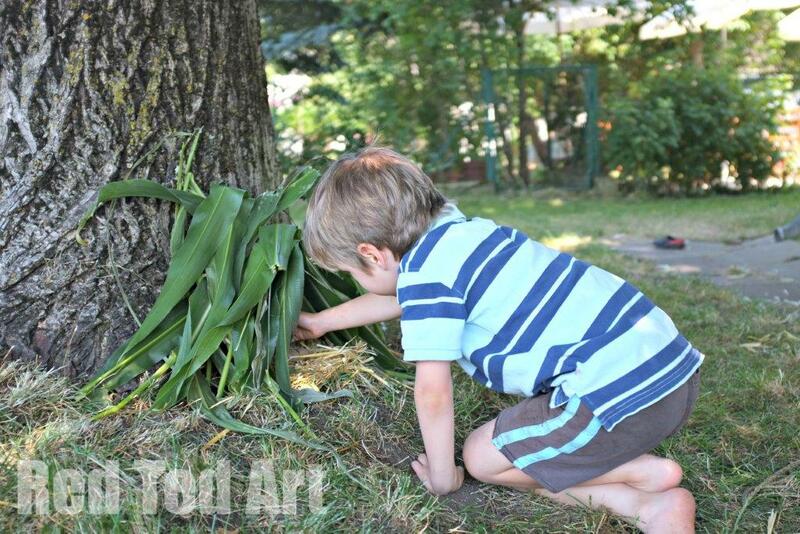 We first made one in our garden – and it was an “elf and fairy house” then. 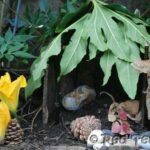 The idea of OUR fairy houses, is that they are made from things you find locally – after all the fairies live locally and they like nature items from their surroundings. 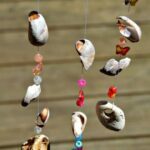 They are never permanent, but just for a week or two, as fairies do like to move on. 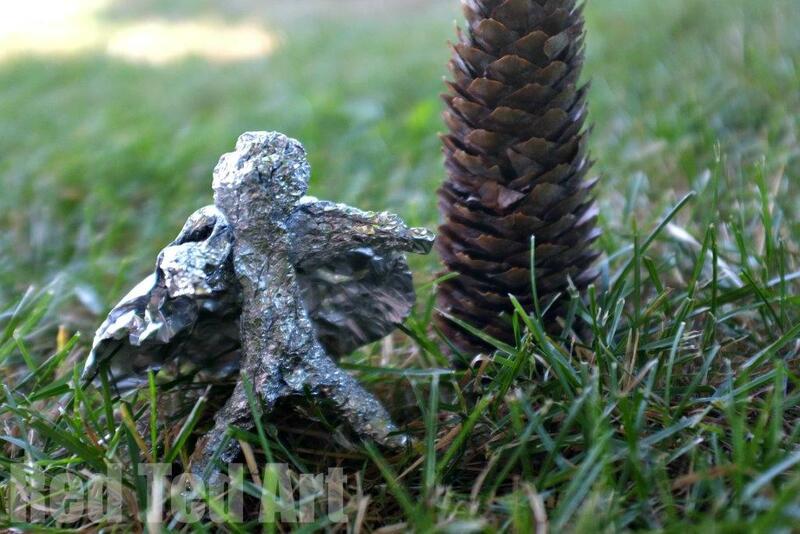 So, the key to our fairy houses, is to make them simple, from local materials and to fret if they fall apart. 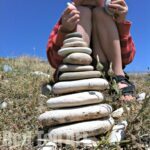 We love hunting for stones, that double up as tables, find flowers to decorate and eat… our fairy house on THIS holiday, was made primarily from Sweetcorn leaves (there was a field opposite, the children took care not to damage the plants). 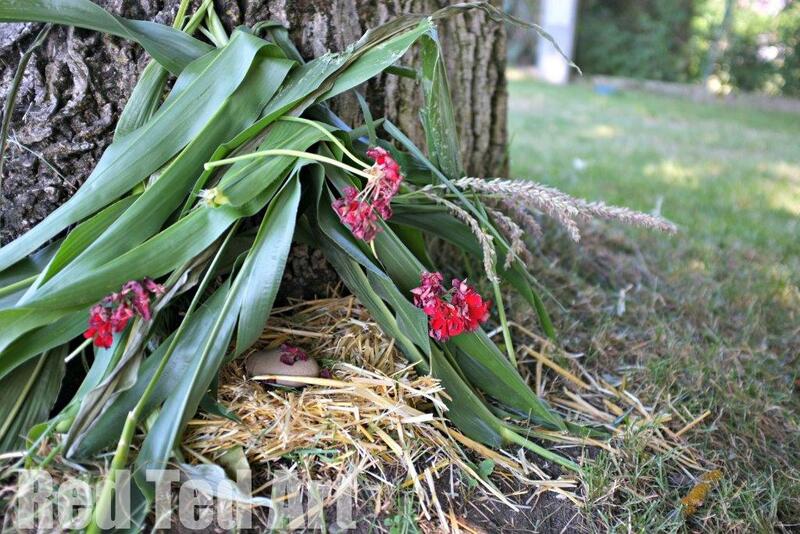 We found some straw on the road and some “dead” flowers and pinecones. Lovely. And that. Was our “creative” part of the holiday. Filling 5min here and 30min there. Hope you enjoyed our simply holiday crafts. 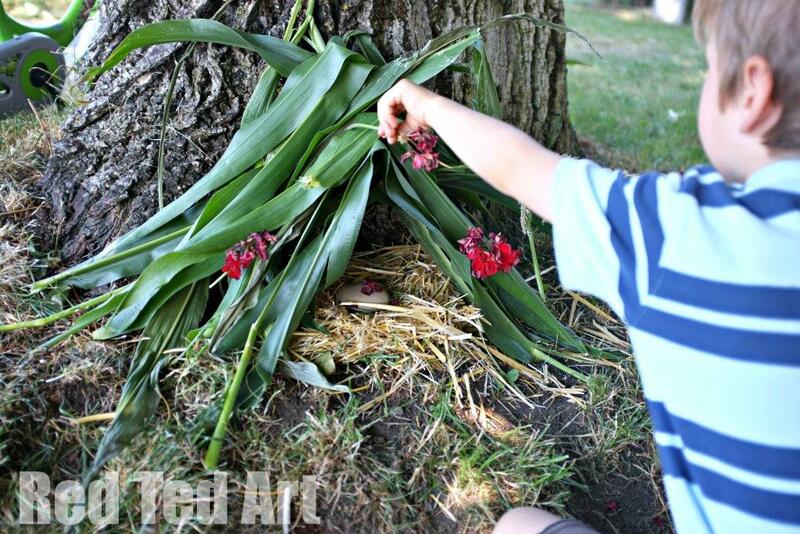 We really do love a good nature fairy house build in the holidays! 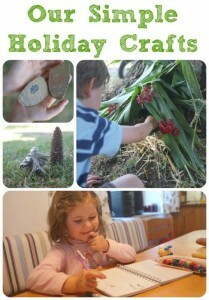 lovely creative holiday crafts, especially like the fairy house. Tried notebooks this summer, but the kids keep ripping out all the pages, so not a lot left to see!